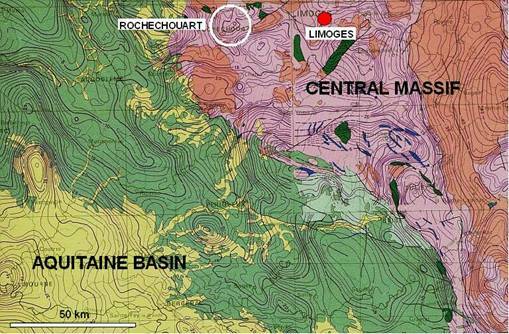 The impact structure is located in southwest France (Fig.1) at the margin of the Central Massif (Fig. 2). The Late Triassic (214 Ma) crystalline-target structure is deeply eroded and lacks any impact-morphological signature. Fig. 1. 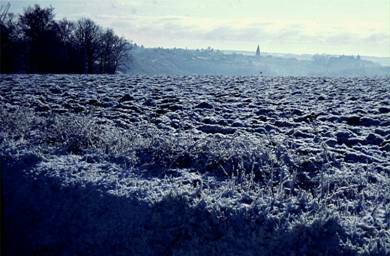 Landscape in the French Limousin with view of the Rochechouart small town. From a gravity survey and the occurrence of impact rocks, the original diameter of the structure is estimated between 20 and 30 km. Rochechouart has been proposed (Spray et al. 1998, Nature, 392, 171-173) to belong to a chain of five craters on Europe and North America (along with Manicouagan and Saint Martin in Canada, Red Wing in the USA, Obolon in Ukraine) indicating the breakup and subsequent impact of a comet or asteroid. A relation with the mass extinction at the end of the Triassic period is being discussed. Fig. 2. Location of the Rochechouart impact structure at the margin of the French Massif Central. Geological general map and gravity Bouguer anomalies (BRGM). Rochechouart shares the same history as many other impact structures. The unusual rocks in the area were reported as early as 1808 (Kraut 1969) and at that time considered either volcanic rocks or man-made products. Until the sixties of the last century, the impactites continued to be regarded as volcanic rocks and also tectonic breccias (see, e.g., the old geological map on the 1 : 80,000 scale, sheet Rochechouart). It was the French geologist François Kraut who in the mid-sixties pointed to the strong similarities between the Rochechouart “volcanic” rocks and the Ries crater impactites. Kraut remembered his early (1937) work on the Rochechouart enigmatic rocks as well as the planar deformation features (PDFs) in quartz he had already observed at that time without giving them further consideration. In the sixties, too, the Ries (Nördlinger Ries) in Germany was the subject of a fierce controversy about the origin of the 25 km-diameter crater, when Shoemaker and Chao had established the coesite and stishovite SiO2 high-pressure modifications in suevite samples of that ring structure. The opponents of an impact origin and advocates of a volcanic explosion origin again and again pointed to the peculiar features of the regional geology even when there were no doubts left about an extraterrestrial origin of the Ries structure (also see http://www.impact-structures.com/spain/ . 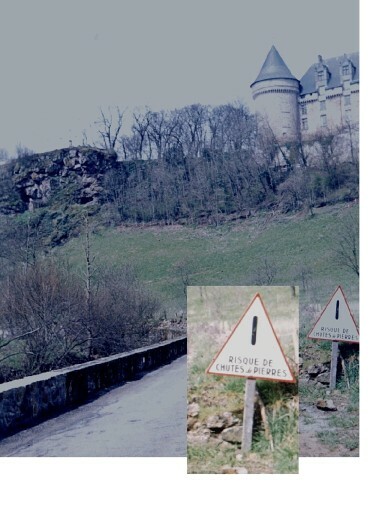 Kraut was aware of this controversy, and in 1968/1969 he stated: In case the Rochechouart melt breccias and PDFs formed by meteorite impact, the whole regional geology has completely to be revised [Kraut, F. (1969). A new impact occurrence in the area of Rochechouart-Chassenon (Haute Vienne et Charente, France). – Geologica Bavarica, 61, 428-450 (in German).]. Here, it is curious to note that 35 years later, the same controversy recurs with Spanish regional geologists from the Zaragoza university and the Madrid Center of Astrobiology (e.g., M. Aurell, A.L. Cortés, E. Díaz-Martínez) vehemently refusing the impact origin of the Azuara and Rubielos de la Cérida impact structures as incompatible with the regional geology (see http://www.impact-structures.com/the-controversy-the-spanish-impact-structures-and-competing-models-of-an-endogenetic-origin/ ). For Rochechouart, the regional geology has actually been completely revised shown in the splendid geological map [CARTE GÉOLOGIQUE DE LA FRANCE À 1/50 000, ROCHECHOUART; Éditions du BRGM, Service géologique national; Notice explicative par Chèvremont et al., 1996]. Corresponding with this map, a geologic cross-section of the impact structure is shown below in Fig. 3. Fig. 3. Geologic cross-section of the Rochechouart impact structure (modified from U. Schärer (1994): Guide for field trip to the Rochechouart impact structure. – ESF Third International Workshop, Limoges).